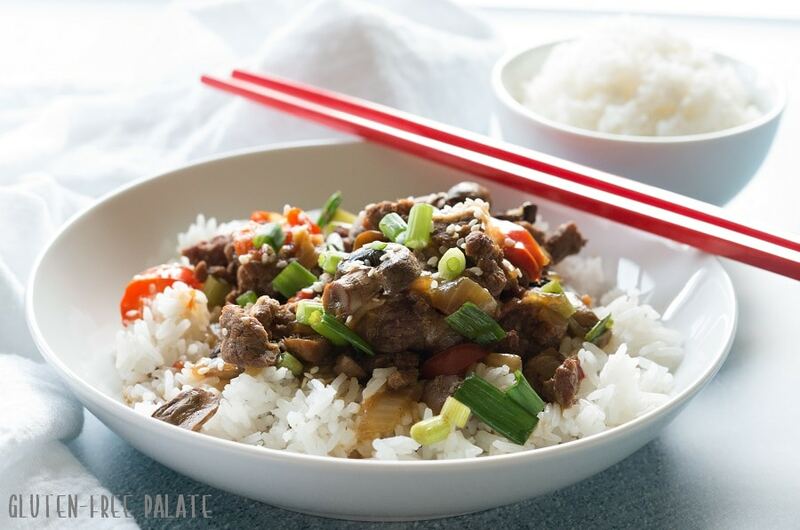 Instant Pot Mongolian Beef is a easy-to-make recipe that you can have on your table in less than 30 minutes. 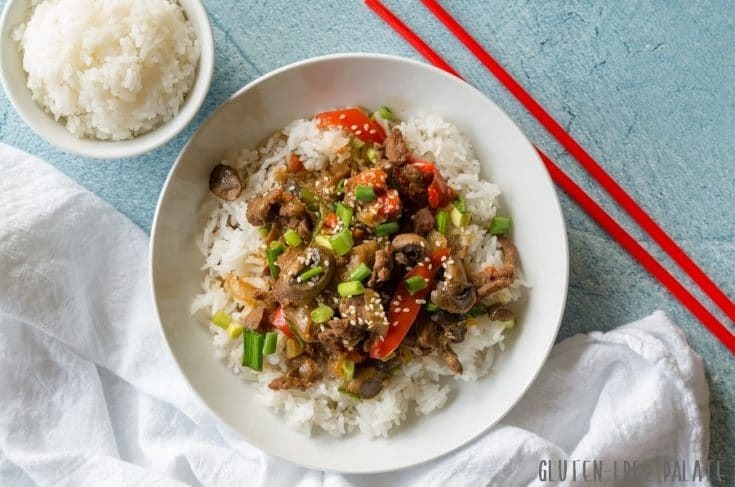 Sweet, savory, and full of flavor it’s the perfect Asian dish to make using your Instant Pot and it’s healthier and less expensive than the takeout version. I may never go for takeout again. This Instant Pot Mongolian Beef is THAT good. It’s even better (and healthier) than the restaurant version. From preheat to releasing the steam, this Instant Mongolian Beef will be on your table in 30 minutes. This savory, flavorful Mongolian beef is going to be a new favorite dinner. It’s packed with protien, veggies, and it’s really simple to make. You need to have the spices and sauces on hand but picking everything up the store will be worth it and you’ll have plenty of leftover ingredients that you can make this several times before having to pick more up. Mongolian beef is easy to convert to gluten free by using gluten-free soy sauce and gluten-free hoisen sauce. 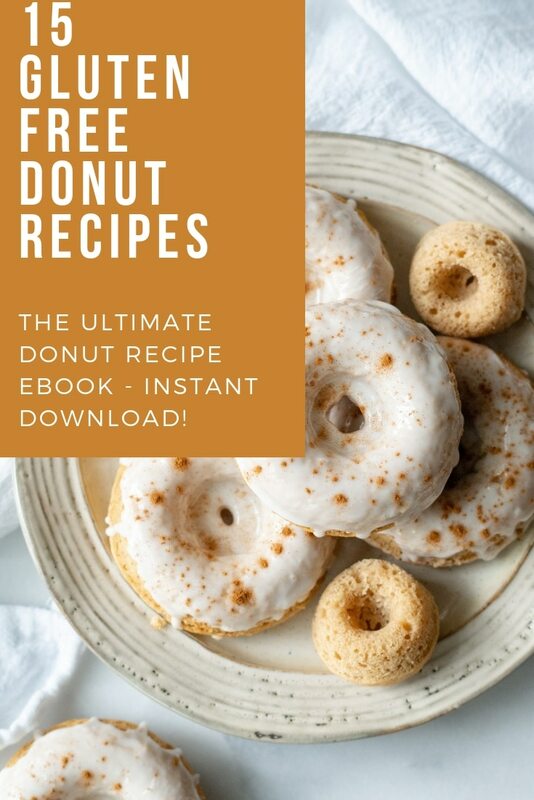 If you don’t need gluten-free then you can use the regular versions. I like to make the rice, and clean up while the Instant Pot is doing it’s magic on this Mongolian beef recipe. Before you know it your instant pot mongolian beef will be ready. This Instant Pot Mongolian beef recipe is much simpler than you might think. A bowl to mix the sauce, a cutting board to chop the veggies, and an instant pot to pull it all together. That’s it. Most Mongolian Beef recipes served at restaurants have little to no vegetables. Usually just green onions. I love putting onion, bell peppers, and mushrooms in mine. If you don’t like one of these, you can simply leave them out. 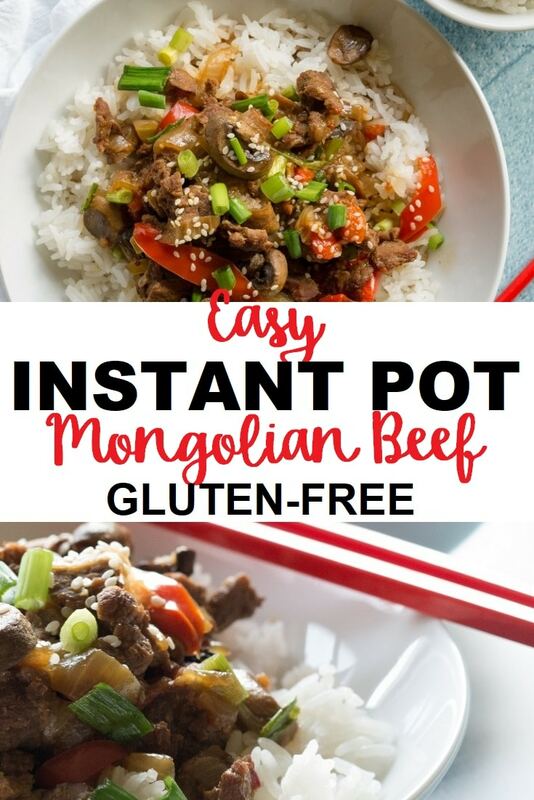 This Instant Pot Mongolian Beef is a spin of my popular Gluten-Free Mongolian Beef Recipe. If you don’t have an instant pot, you still can make this tasty meal on the stove top. What cut of beef do you use to make Mongolian beef? Most restaurants and recipes call for flank steak to make Mongolian beef. Sometimes I will buy flank steak and sometimes I buy other cuts of beef it it’s on sale. As long as you cut the beef into thing strips you should be fine. You can always tenderize the beef before you cut it if you are worried about it being tough or chewy. What is Mongolian Beef sauce made of? Most Mongolian beef recipes call for a combination of soy sauce, water, sugar (usually brown), chili sauce, rice wine or cooking sherry, hoisin, and some spices. Sometimes you will see a variation and a few add more spice, sometimes in the form of sriracha. The sauce is spicy, and a little sweet making it the perfect match to serve with a sticky rice or basmati rice. Basmati rice is our family’s favorite. I like to top mine with sesame seeds and additional green onion. My husband likes his extra spicy and adds a dash of chili oil. This Instant Pot Mongolian Beef is amazing as left overs too. Combine the first seven ingredients for the sauce; set aside. Add sliced sirloin, ginger, and garlic to your Instant Pot. Toss in red onion, mushrooms, and bell pepper. Pour sauce over the beef and veggies. Set to manual or pressure cook for 10-12 minutes. Once done, let it sit for 5 minutes before releasing the steam. Server over rice or cauliflower rice. Not only is this Instant Pot Mongolian Beef ready in less than 30 minutes, it’s healthy to boot. It’s high in protien and low in carbs (especially when served over cauliflower rice). If you are looking for a quick rice recipe, this Instant Pot Rice is super quick to make. If you like simple Instant Pot Recipes, you’ll love my Instant Pot (Slow Cooker) Beef Short Ribs. If you are looking for a slow cooker version, I also have a recipe for Savory Beef Short Ribs that works in a slow cooker. 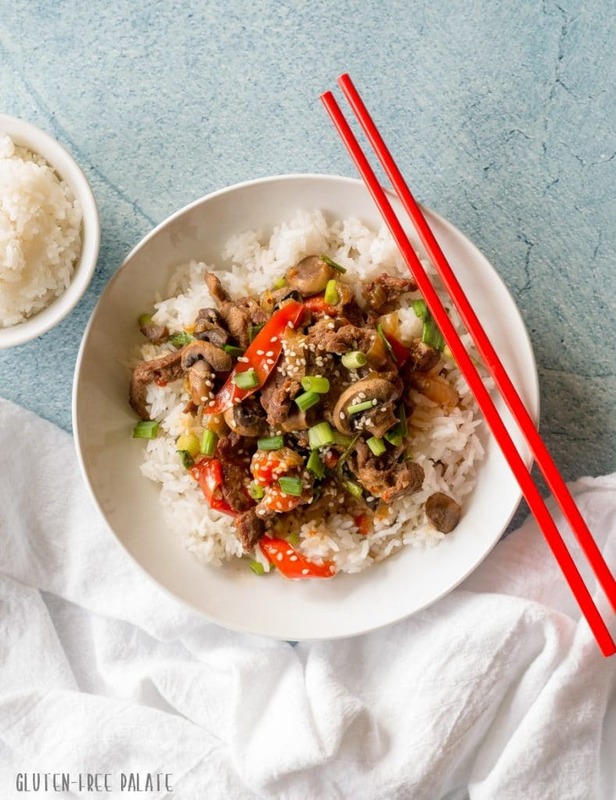 An incredibly flavorful dish loaded with beef, veggies, and a spicy sauce, this Instant Pot Mongolian Beef can be on your dinner table in less than 30 minutes. I love Mongolian beef! 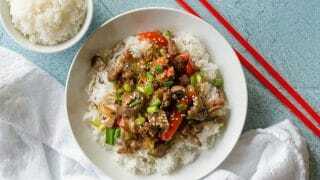 One of my favorite Asian recipes, but I haven’t made it in an Instant Pot yet, I’ll have to try it when I buy myself an IP! I was just looking for a new recipe for my InstantPot, so thank you for helping me find one. Looks delicious! I’m all about the spicy sauce. I’m wondering if I could do something similar with tofu? Guess I’ll have to try. 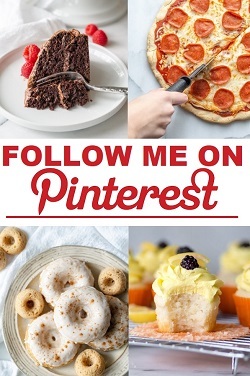 I really should refrain from looking at recipes when it is almost supper time. Now I want this instead of what I cooked! I love how you added more vegetables than a typical Mongolian Beef recipe, it’s right up my alley. Looks flavorful and delicious! This is such a beautiful dish. I bet I could sub beans for a vegan version! Now you’re talking! This sounds better than anything I’d get in a restaurant. And I’d be safe eating it, too! If you look in the post, I have a simple stove top version linked. 🙂 Instant Pots are a high pressure cooker that cooks meals that would normally be cooked in a slow cooker, but much quicker. You can stick to the stove top version though. It’s quick, I promise! Oh I only saw the beef short ribs at the bottom, but now I see the recipe you’re referring to. Thanks a lot! This dinner would go over so well in our house. My husband has been really into crockpotting lately – especially Asian food – I might need to get him an instant pot for his birthday! Mongolian beef is one of my husband’s favorites. We’ll have to make this in our new IP! I used a bag of recipe starter onions and peppers. If you like spicy then double the chili garlic paste. 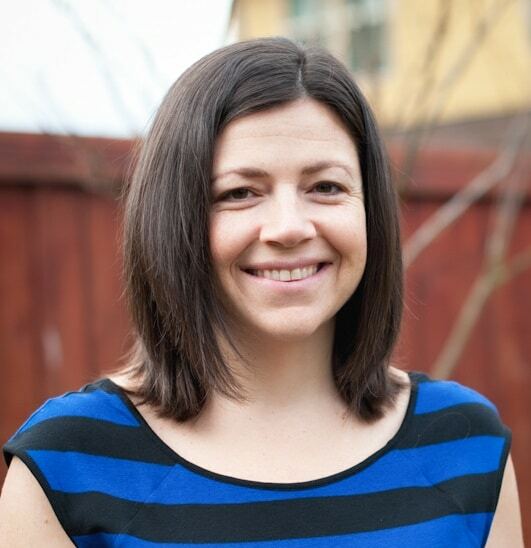 Thank you for taking time to stop back by and leave a review. I’m so glad you liked it. I’m so happy they liked it! Thank you for letting me know.